Genome annotation is the identification and understanding of the genetic elements of a sequenced genome. Once a genome is sequenced, all of the sequencings must be analyzed to understand what they mean. Critical to annotation is the identification of the genes in a genome, the structure of the genes, and the proteins they encode. Once a genome is annotated, further work is done to understand how all the annotated regions interact with each other. BLAST: In bioinformatics, Basic Local Alignment Search Tool, or BLAST, is an algorithm for comparing primary biological sequence information, such as the amino-acid sequences of different proteins or the nucleotides of DNA sequences. Genome projects are scientific endeavors that ultimately aim to determine the complete genome sequence of an organism (be it an animal, a plant, a fungus, a bacterium, an archaean, a protist, or a virus). They annotate protein-coding genes and other important genome-encoded features. The genome sequence of an organism includes the collective DNA sequences of each chromosome in the organism. For a bacterium containing a single chromosome, a genome project will aim to map the sequence of that chromosome. Once a genome is sequenced, it needs to be annotated to make sense of it. An annotation (irrespective of the context) is a note added by way of explanation or commentary. Since the 1980’s, molecular biology and bioinformatics have created the need for DNA annotation. DNA annotation or genome annotation is the process of identifying the locations of genes and all of the coding regions in a genome and determining what those genes do. Genome Annotation: Here a small region of genome is annotated, with various elements identified. The annotation of an entire genome would entail a similar in depth analysis of thousand even millions of such DNA sequences. Genome annotation is the process of attaching biological information to sequences. It consists of two main steps: identifying elements on the genome, a process called gene prediction, and attaching biological information to these elements. Automatic annotation tools try to perform all of this by computer analysis, as opposed to manual annotation (a.k.a. curation) which involves human expertise. Ideally, these approaches co-exist and complement each other in the same annotation pipeline (process). The basic level of annotation is using BLAST for finding similarities, and then annotating genomes based on that. However, nowadays more and more additional information is added to the annotation platform. The additional information allows manual annotators to deconvolute discrepancies between genes that are given the same annotation. Some databases use genome context information, similarity scores, experimental data, and integrations of other resources to provide genome annotations through their Subsystems approach. Other databases rely on both curated data sources as well as a range of different software tools in their automated genome annotation pipeline. Structural annotation consists of the identification of genomic elements: ORFs and their localization, gene structure, coding regions, and the location of regulatory motifs. Functional annotation consists of attaching biological information to genomic elements: biochemical function, biological function, involved regulation and interactions, and expression. Homology describes the relationship between genes and how they are inherited from ancestors. A homologous gene (or homolog) is a gene inherited in two species by a common ancestor. While homologous genes can be similar in sequence, similar sequences are not necessarily homologous. Orthologous are homologous genes where a gene diverges after a speciation event, but the gene and its main function are conserved. If a gene is duplicated in a species, the resulting duplicated genes are paralogs of each other, even though over time they might become different in sequence composition and function. conserved: In biology, conserved sequences are similar or identical sequences that occur within nucleic acid sequences (such as RNA and DNA sequences), protein sequences, protein structures. selective pressure: Any cause that reduces reproductive success in a proportion of a population, potentially exerts evolutionary pressure or selection pressure. Homology forms the basis of organization for comparative biology. A homologous trait is often called a homolog (also spelled homologue). In genetics, the term “homolog” is used both to refer to a homologous protein and to the gene ( DNA sequence) encoding it. As with anatomical structures, homology between protein or DNA sequences is defined in terms of shared ancestry. Two segments of DNA can have shared ancestry because of either a speciation event (orthologs) or a duplication event (paralogs). Homology among proteins or DNA is often incorrectly concluded on the basis of sequence similarity. The terms “percent homology” and “sequence similarity” are often used interchangeably. As with anatomical structures, high sequence similarity might occur because of convergent evolution, or, as with shorter sequences, because of chance. Such sequences are similar, but not homologous. Sequence regions that are homologous are also called conserved. This is not to be confused with conservation in amino acid sequences in which the amino acid at a specific position has been substituted with a different one with functionally equivalent physicochemical properties. One can, however, refer to partial homology where a fraction of the sequences compared (are presumed to) share descent, while the rest does not. For example, partial homology may result from a gene fusion event. Example of Homologous DNA: This is the sequence alignment of a homologous protein from two different species The “*” represent a conserved amino acid in the two proteins. Homologous sequences are orthologous if they were separated by a speciation event: when a species diverges into two separate species, the copies of a single gene in the two resulting species are said to be orthologous. Orthologs, or orthologous genes, are genes in different species that originated by vertical descent from a single gene of the last common ancestor. For instance, the plant Flu regulatory protein is present both in Arabidopsis (multicellular higher plant) and Chlamydomonas (single cell green algae). The Chlamydomonas version is more complex: it crosses the membrane twice rather than once, contains additional domains, and undergoes alternative splicing. However, it can fully substitute the much simpler Arabidopsis protein, if transferred from algae to plant genome by means of gene engineering. Significant sequence similarity and shared functional domains indicate that these two genes are orthologous genes, inherited from the shared ancestor. Orthologous sequences provide useful information in taxonomic classification and phylogenetic studies of organisms. The pattern of genetic divergence can be used to trace the relatedness of organisms. Two organisms that are very closely related are likely to display very similar DNA sequences between two orthologs. Conversely, an organism that is further removed evolutionarily from another organism is likely to display a greater divergence in the sequence of the orthologs being studied. Homologous sequences are paralogous if they were separated by a gene duplication event: if a gene in an organism is duplicated to occupy two different positions in the same genome, then the two copies are paralogous. Paralogous genes often belong to the same species, but this is not necessary. For example, the hemoglobin gene of humans and the myoglobin gene of chimpanzees are paralogs. Paralogs can be split into in-paralogs (paralogous pairs that arose after a speciation event) and out-paralogs (paralogous pairs that arose before a speciation event). Between species out-paralogs are pairs of paralogs that exist between two organisms due to duplication before speciation. Within species out-paralogs are pairs of paralogs that exist in the same organism, but whose duplication event happened after speciation. Paralogs typically have the same or similar function, but sometimes do not. Due to lack of the original selective pressure upon one copy of the duplicated gene, this copy is free to mutate and acquire new functions. Paralogous sequences provide useful insight into the way genomes evolve. The genes encoding myoglobin and hemoglobin are considered to be ancient paralogs. Similarly, the four known classes of hemoglobins (hemoglobin A, hemoglobin A2, hemoglobin B, and hemoglobin F) are paralogs of each other. While each of these proteins serves the same basic function of oxygen transport, they have already diverged slightly in function: fetal hemoglobin (hemoglobin F) has a higher affinity for oxygen than adult hemoglobin. However, function is not always conserved. Human angiogenin diverged from ribonuclease, for example, and while the two paralogs remain similar in tertiary structure, their functions within the cell are now quite different. The polymerase chain reaction (PCR) is a method by which DNA is amplified. PCR is used to amplify a specific region of DNA. PCR typically consists of three steps: denaturation, annealing, and elongation. The amplified DNA can be used for many purposes, such as identifying different genes and species of bacteria. 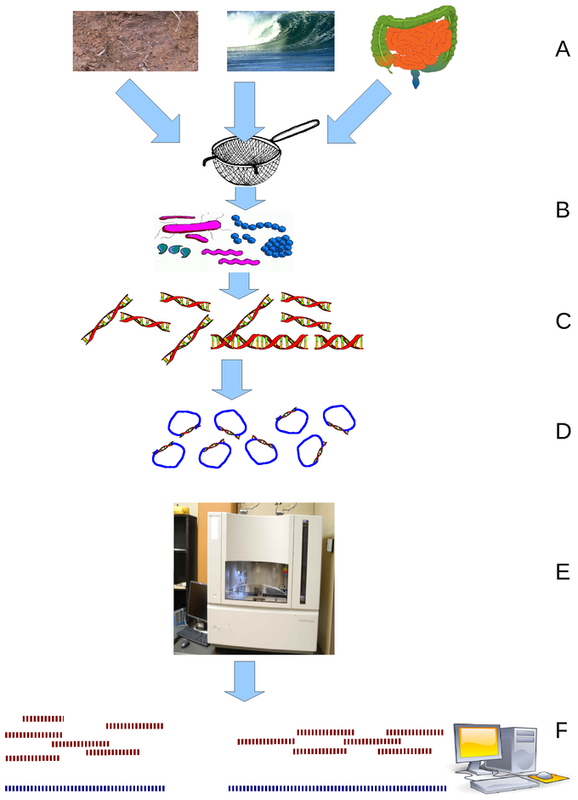 annealing: Annealing, in genetics, means for complementary sequences of single-stranded DNA or RNA to pair by hydrogen bonds to form a double-stranded polynucleotide. The term is often used to describe the binding of a DNA probe, or the binding of a primer to a DNA strand during a polymerase chain reaction (PCR). The term is also often used to describe the reformation (renaturation) of complementary strands that were separated by heat (thermally denatured). Proteins such as RAD52 can help DNA anneal. The polymerase chain reaction (PCR) is a biochemical technology in molecular biology used to amplify a single, or a few copies, of a piece of DNA across several orders of magnitude, generating thousands to millions of copies of a particular DNA sequence. The method relies on thermal cycling, consisting of cycles of repeated heating and cooling of the reaction for DNA melting and enzymatic replication of the DNA. 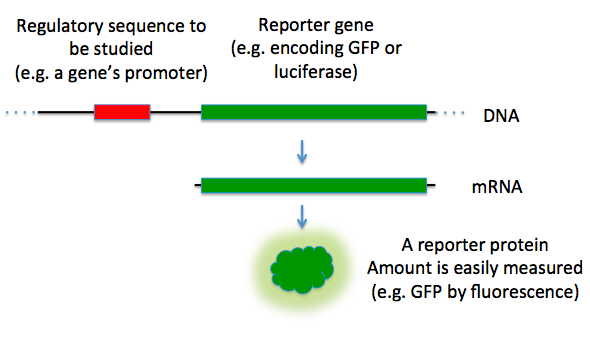 Primers (short DNA fragments) containing sequences complementary to the target region, along with a DNA polymerase (after which the method is named) are key components to enable selective and repeated amplification. As PCR progresses, the DNA generated is itself used as a template for replication, setting in motion a chain reaction in which the DNA template is exponentially amplified. PCR can be extensively modified to perform a wide array of genetic manipulations. Typically, PCR consists of a series of 20-40 repeated temperature changes, called cycles, with each cycle commonly consisting of two to three discrete temperature steps, usually three. The temperatures used, and the length of time they are applied in each cycle, depend on a variety of parameters. These include the enzyme used for DNA synthesis, the concentration of divalent ions and dNTPs in the reaction, and the melting temperature (Tm) of the primers. The Steps of PCR: This illustrates a PCR reaction to demonstrate how amplification leads to the exponential growth of a short product flanked by the primers. 1. Denaturing at 96°C. 2. Annealing at 68°C. 3. Elongation at 72°C. The first cycle is complete. The two resulting DNA strands make up the template DNA for the next cycle, thus doubling the amount of DNA duplicated for each new cycle. Denaturation step: This step is the first regular cycling event and consists of heating the reaction to 94-98°C. It causes DNA melting of the DNA template by disrupting the hydrogen bonds between complementary bases, yielding single-stranded DNA molecules. Annealing step: The reaction temperature is lowered to 50-65°C for 20-40 seconds allowing annealing of the primers to the single-stranded DNA template. Extension/elongation step: The temperature at this step depends on the DNA polymerase used; Taq polymerase has its optimum activity temperature at 75-80°C, and commonly a temperature of 72°C is used with this enzyme. At this step the DNA polymerase synthesizes a new DNA strand complementary to the DNA template strand by adding dNTPs that are complementary to the template in 5′ to 3′ direction, condensing the 5′-phosphate group of the dNTPs with the 3′-hydroxyl group at the end of the nascent (extending) DNA strand. 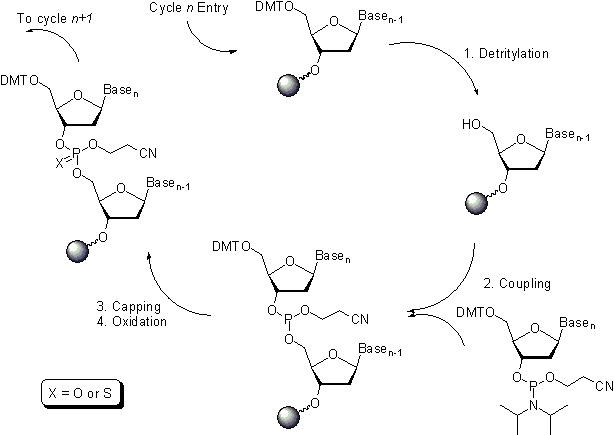 After elongation, the cycle goes back to step one, usually for 20-40 cycles. Under optimum conditions (i.e., if there are no limitations due to limiting substrates or reagents) at each extension step, the amount of DNA target is doubled, leading to exponential (geometric) amplification of the specific DNA fragment. Sanger sequencing is based on the incorporation and detection of labeled ddNTPs as terminal nucleotides in DNA amplification. 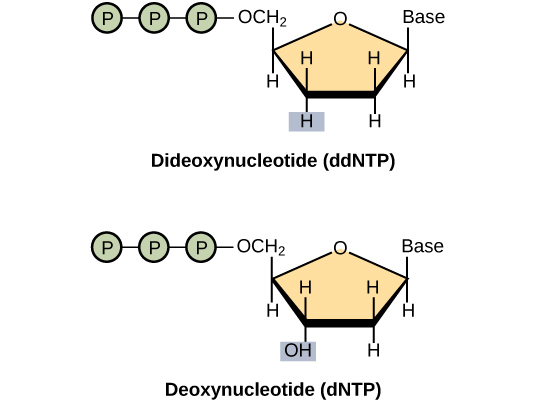 The lack of the second deoxy group on an dNTP making it ddNTP, stops the incorporation of further nucleotides, this termination creates DNA lengths stopped at every nucleotide, this is central to further identifying each nucleotide. Different labels can be used, ddNTPS, dNTPs and primers can all be labelled with radioactivity and fluorescently. Using fluorescent labels, dideoxy sequencing can be automated allowing high-throughput methods which have been utilized to sequence entire genomes. chromatogram: The visual output from a chromatograph. Usually a graphical display or histogram. Sanger sequencing, also known as chain-termination sequencing, refers to a method of DNA sequencing developed by Frederick Sanger in 1977. This method is based on amplification of the DNA fragment to be sequenced by DNA polymerase and incorporation of modified nucleotides – specifically, dideoxynucleotides (ddNTPs). The classical chain-termination method requires a single-stranded DNA template, a DNA primer, a DNA polymerase, normal deoxynucleotidetriphosphates (dNTPs), and modified nucleotides (dideoxyNTPs) that terminate DNA strand elongation. These chain-terminating nucleotides lack a 3′-OH group required for the formation of a phosphodiester bond between two nucleotides, causing DNA polymerase to cease extension of DNA when a ddNTP is incorporated. The ddNTPs may be radioactively or fluorescently labelled for detection in automated sequencing machines.The DNA sample is divided into four separate sequencing reactions, containing all four of the standard deoxynucleotides (dATP, dGTP, dCTP and dTTP) and the DNA polymerase. To each reaction is added only one of the four dideoxynucleotides (ddATP, ddGTP, ddCTP, or ddTTP). Following rounds of template DNA extension from the bound primer, the resulting DNA fragments are heat denatured and separated by size using gel electrophoresis. This is frequently performed using a denaturing polyacrylamide-urea gel with each of the four reactions run in one of four individual lanes (lanes A, T, G, C). The DNA bands may then be visualized by autoradiography or UV light and the DNA sequence can be directly read off the X-ray film or gel image. Sanger sequencing: Different types of Sanger sequencing, all of which depend on the sequence being stopped by a terminating dideoxynucleotide (black bars). Technical variations of chain-termination sequencing include tagging with nucleotides containing radioactive phosphorus for radiolabelling, or using a primer labeled at the 5′ end with a fluorescent dye. Dye-primer sequencing facilitates reading in an optical system for faster and more economical analysis and automation. The later development by Leroy Hood and coworkers of fluorescently labeled ddNTPs and primers set the stage for automated, high-throughput DNA sequencing. Chain-termination methods have greatly simplified DNA sequencing. 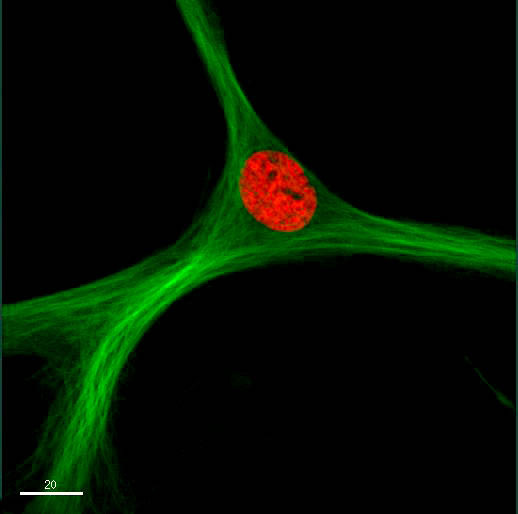 More recently, dye-terminator sequencing has been developed. 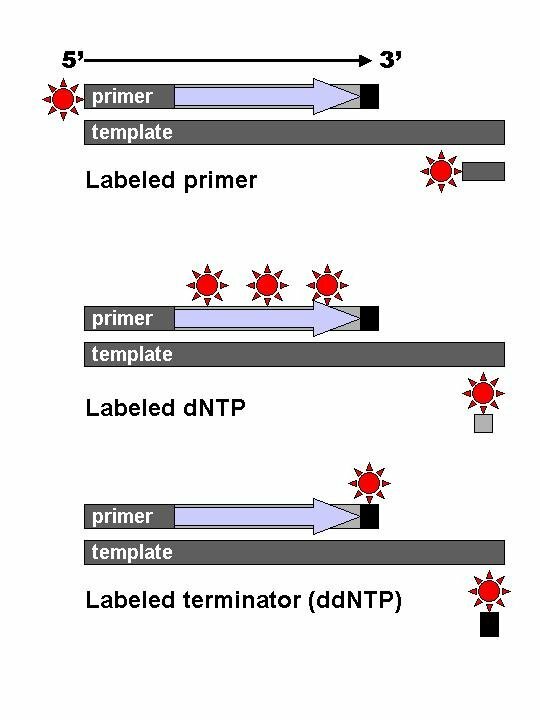 Dye-terminator sequencing utilizes labelling of the chain terminator ddNTPs, which permits sequencing in a single reaction, rather than four reactions as in the labelled-primer method. In dye-terminator sequencing, each of the four dideoxynucleotide chain terminators is labelled with fluorescent dyes, each of which emit light at different wavelengths. Chromatograph: This is an example of the output of a Sanger sequencing read using fluorescently labelled dye-terminators. The four DNA bases are represented by different colours which are interpreted by the software to give the DNA sequence above. Automated DNA-sequencing instruments (DNA sequencers) can sequence up to 384 DNA samples in a single batch (run) in up to 24 runs a day. DNA sequencers carry out capillary electrophoresis for size separation, detection and recording of dye fluorescence, and data output as fluorescent peak trace chromatograms. Automation has lead to the sequencing of entire genomes.